In the early 1880s, the young Portugal António Júlio Rodrigues de Azevedo Coutinho (1860-1918) devised an interesting key adding device, which he patented in Brasil in 1882, and later in Germany (patent DE30421, 19 August 1884). 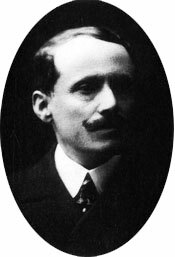 António Júlio Rodrigues de Azevedo Coutinho was born on 11 July, 1860, in Quinta de Bouçó, Fontarcada (Póvoa de Lanhoso), northern Portugal. His father João Antonio Rodrigues de Azevedo Coutinho was a local farmer and vine producer, but he was an educated man and even has a book published. António de Azevedo Coutinho worked as a journalist and writer in Póvoa de Lanhoso, then in the nearby Braga. In 1890 he relocated to Porto, where he worked for insurance companies. António de Azevedo Coutinho died in Porto on 7 September, 1918. The adding machine of d'Azevedo has a simple and reliable construction, but never went in production and remained only on paper. Let's examine the mechanism of the device, using the patent drawing. By depressing a key (marked with a in the lower drawings) the underlying wheel b is rotated. The wheels b have different number of teeth, according to the key (e.g. the wheel for 1 key has 1 tooth, that for 2 key has 2 teeth, etc.) The keys are returned in the initial position by means of springs. The movement from the wheels b will be transmitted to the 10-teeth wheels d, mounted on the tetragonal axis g. Then, by means of the permanently engaged ratchet wheels f1 and f2, the movement will be transferred to the result mechanism (axis g (which is held in the proper position by a spring), and the result wheels i). The tens carry mechanism is implemented by means of the wheels j, mounted on the axis k. Fixing of the wheels in the position is done by means of springs. 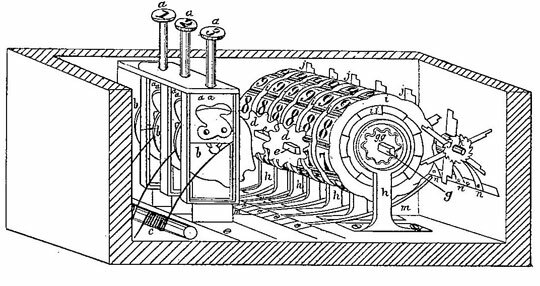 The zeroing of the mechanism is done by turning the knob l (in the left side of the box).